Visualisation and interactive media project exhibition and industry talks and keynotes. 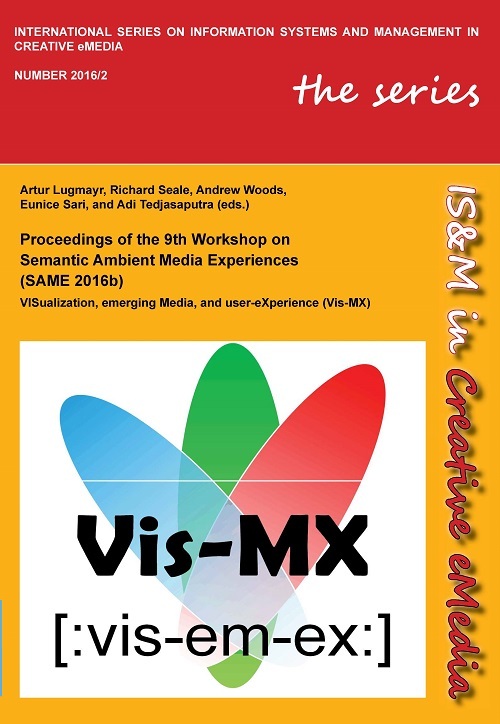 Conference proceedings will be published in the SCOPUS ranked proceedings series Proceedings of Semantic Ambient Media (SAME). These include extended position papers, demonstration proposals, award entries, and industry talks. Selected high quality papers will be published in an ERA ranked international journal or an edited book. Best contributions will be published within the International Journal of Web Based Communities (IJWBC), ERA listed, and indexed in Scopus, ACM, and DBLP. There will be a reward for the overall best contribution to the event, as well as an award for the best demonstration. All the papers should follow the style guidelines of the conference. Position papers are based on an abstract (minimum 200-300 words) but can be extended towards max. 8 pages. You should follow the conference template style which can be found [here]. In addition, all contribution should include a short biography (100-250 words) and a picture of the authors. If you are submitting a demonstration or award submission, please follow the instructions below. All submissions will be peer-reviewed double blinded, therefore please remove any information that could give an indication of the authorship. Final papers should be between 2-8 pages long. Please follow the final paper template strictly. You can download it from [iamea-word-template-v1-0]. You will also need to sign a copyright form for your final submission, and you can find the copyright form [Copyright Form]. Please sign the copyright form, scan it, and attach the digital version to the final submission package. You will need to zip the complete submission package, and re-upload it to the submission system. Please simply re-upload your original submission with the submission id that you have been using originally. Only the very best papers will be selected for the journal special issue. Therefore it’s worthwhile to put some efforts into the final submission. Demonstration proposals shall be 2-3 pages and include: a) a description and motivation of the demonstration; b) general architecture of the demonstration; c) description of the main features; d) a brief comparison with other existing related demonstrations; e) audio-visual materials to illustrate the demonstration (if applicable); f) the type of license, and g) the Internet address of the demonstration (if applicable). It is strongly recommended that the authors make the demonstration (or a suitable version or movie) on the Internet during the evaluation. Extended abstracts should be between 1-2 pages long and contain 500-800 words. They should describe the research problem, background, research questions, and the contribution to the conference. Posters should be between 2-3 pages long and a poster should be presented during the conference. Attendees have the possibility to exhibit their posters on a A0 poster wall during the conference.